The Georgian facade of the White Bear faces the centre of the market square in Shipston on Stour. The Bear, as it is known to the locals, is a lively traditional pub on the A3400 in the north Cotswold's, offering good food and fine ales. You can be assured of a warm welcome from the friendly staff whether for a quick drink or a short break. 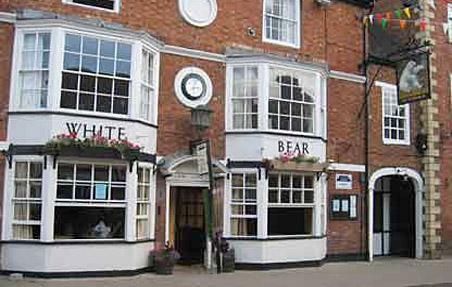 The White Bear Hotel is the perfect location from which to tour the heart of England. The University City of Oxford, Shakespeare's Stratford and the working towns of the Cotswold's such as Stow on the Wold, Moreton in Marsh and Chipping Norton are all just a short trip away.